I am a sucker for reality TV. I don’t care that it’s not actual reality. I’m always pulled in to the drama, scandal, and hype. I will fully admit to binge watching the first two seasons of Dance Moms over winter break. No regrets. Reading Something Real is like watching reality TV, with heart. So much of Something Real reminded me of Jon & Kate Plus 8. I never watched the show but I think everyone has seen the recent awkward Good Morning America interview with Kate and her two teenage daughters. That interview is how I imagined Bonnie felt when she learned the show she had been on throughout her childhood, Baker’s Dozen, was coming back on after a few year hiatus. I really liked Bonnie. I understood the multitude of reasons why she didn’t want camera’s crawling all over her house and paparazzi stalking her. Due to her unique situation it was impossible for her story to not tug at your heart strings. Her mother never listens to her and her father is gone, Bonnie really only has her brother Benny to depend on. The story is really all about Bonnie finding her voice and becoming her own person. If I really liked Bonnie then I adored Benny. He is Bonnie’s brother and one of the Baker’s Dozen. Benny was light no matter the situation and really balanced out Bonnie’s panicked, quieter, personality. I also loved Benny’s quiet strength. He wasn’t looking to become the poster child for anything, or start a movement. He just wasn’t afraid to be himself. Then there was Patrick. He was definitely swoon-worthy although not in the traditional way. Actually, the descriptions made me think he was unattractive, not really my type. What was amazing and swoony about Patrick was how he treats Bonnie. He is there for her no matter what. Reading Something Real is just like reality TV, It pulls you in, keeps you interested with the drama and scandal, but unlike reality TV when you turn the final page, and the cameras stop rolling, you are left feeling hopeful that all of these characters you have come to love are going to end up being okay people. Since Valentines Day is this week Heather Demetrios has set up a Book Boyfriends Facebook page where she will be posting fun memes around the #PatrickSheldonIsMyBoyfriend hashtag and #BentonBakerIsMyBoyfriend hashtag. She'll also be doing lots of interactive stuff like Patrick and Benny trivia, etc. and posting this clip and the full video of this ridiculously awesome Patrick song that was performed at the book launch. 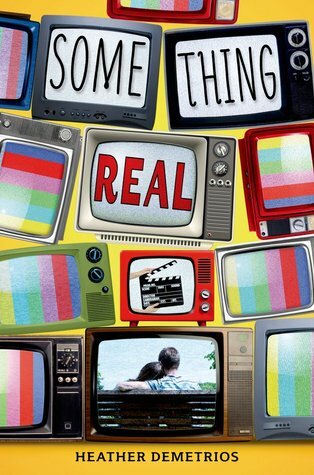 You can also enter WIN a copy of Something Real as part of the Something Real Blog Tour Just enter below! Yay! I love free books and this looks like a worthwhile book so I've entered and now I've got my fingers crossed! I saw that GMA episode! Oh how awkward. Anyway, I'm curious about this book. While I'm not a fan of reality shows, I'm interested to see what goes on behind the scenes. This might be an insight to that. I really hate reality TV, but I've always been pulled towards shows about large families, probably because I come from a family of seven kids and it's interesting to see the similarities. And for that same reason I'm really interested to read this book.